Separation-Individuation Struggles in Adult life: Leaving Home focuses on the developmental task of separating from parents and siblings for individuals and couples who have not been able to resolve these issues earlier in life. Sarah Fels Usher extends Mahler’s theory, and includes the writing of Loewald and Modell, among others, stressing the right of adult patients to a separate life. She describes the predicament of Oedipal victors (or victims), their introjected feelings of responsibility for their parents, and their resultant inability to be truly individuated adults. Difficulties separating from siblings are also given analytic attention. Usher’s experience treating couples adds a new and powerful dimension to her theory. She is optimistic throughout about the therapist’s ability to help adult patients resolve the rapprochement sub-phase in a satisfying manner. An additional, crucial question is raised when the author asks if the therapist can allow the patient to terminate treatment. Has the therapist achieved separation from their own parents—or, indeed, from their analyst? Exploring the plight of patients of the unseparated analyst, Usher describes how these generational factors rear their unfortunate heads when it is time to end therapy. Listening to patients from the perspective of separation-individuation is not new; what is new is Usher’s emphasis on how these particular issues are often masked by significant achievement in adult professional life. 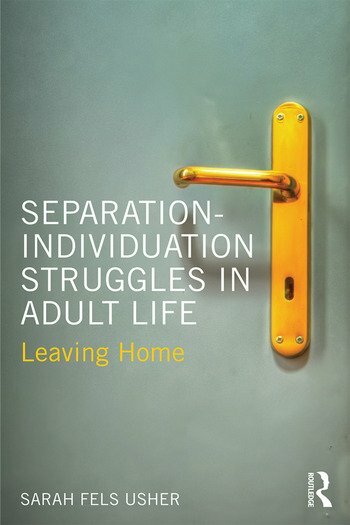 Separation-Individuation Struggles in Adult Life: Leaving Home will be of great importance for psychoanalysts and psychoanalytic psychotherapists working with adults, as well as for clinical postgraduate students. Introduction. 1 What We Know So Far 2 Oedipal Victor or Victim: Individuals 3 Oedipal Victor or Victim: Couples 4 Home Is Where We Start From: The Sibling Connection 5 Out of the Woods: Treatment Pauses and Termination 6 Conclusion: You Can Go Home Again (If You Resolve Your Rapprochement Crisis). Sarah Fels Usher is a psychologist and psychoanalyst in private practice in Toronto, Canada. She is past president of the Toronto Psychoanalytic Society, Founding Director of the Fundamental Psychoanalytic Perspectives Program, and a faculty member of the Toronto Institute of Psychoanalysis. Dr. Usher is also the English language book editor of the Canadian Journal of Psychoanalysis/Revue canadienne de psychoanalyse, and author of the Routledge titles What is This Thing Called Love? (2007) and Introduction to Psychodynamic Psychotherapy Technique, 2nd Edition (2013). "This highly informative volume extrapolates Margaret Mahler’s childhood separation-individuation paradigm to adult psychic development. Addressing major milestones of separation during adulthood and persistent conflicts around separateness, Usher’s book becomes a powerful source of enhancing empathy on the part of parents, mentors, and clinicians for those under their care. This is a major achievement and deserves our appreciation and gratitude. "-Salman Akhtar, MD, Professor of Psychiatry, Supervising and Training Analyst, Psychoanalytic Center of Philadelphia. "Bridging Intra-psychic, interpersonal and socio-cultural perspectives, this book explores the complexities of separation, loss, and individuation in the context of the twenty-first century. Although self and object constancy are normally achieved antecedent to the Oedipal phase of development, aspects of separation-individuation process continue through the life cycle. Long after the onset of adulthood the internal need for a caring, protective parent persists, with significant influence on cognition, emotion, and behavior. Mental health professionals will find Sarah Usher's book to be very informative, stimulating inquiry and integration. "-Harold P. Blum, M.D. "Usher has produced yet another clinical gem. The down-to-earth charm of her abundant case reports embodies a significant theoretical integration of ego psychology, attachment theory, and self-psychology—without essentializing early development. Mahler’s central infant conflict is reconceived as a cyclical life dynamic that also spans the generations. Bridging the gap between psychoanalytic psychotherapy and couples counseling, Usher shows us how to reweave the present with our patients through the dimly known strands of their family histories. "-Charles Levin, Ph.D, Director, Canadian Institute of Psychoanalysis (Quebec English Branch), Editor-in-chief, Canadian Journal of Psychoanalysis.